Object identification using multiple parameters. 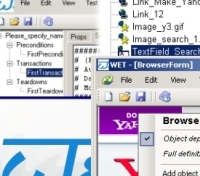 WET is a opensource web automation testing tool which uses Watir as the library to drive web pages. You dont have to download / install Watir separately or know anything about Watir. Watir is the library that WET uses and it is automatically installed for you. 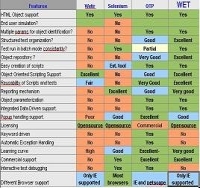 Who should use WET: Any level of test engineer who wants to automate his web testing. An Advanced test automation engineer can directly take the full advantages of the WET Core engine. Since WET is written using Ruby, it exposes a tremendous amount of raw horse power. While WET has many built in testing abilities, a tester can also add libraries / use existing libraries to acheive just about any level of test automation. Your test automation is only gated by your ability to imagine. WET scripts that are created by either writing from the ground up or by using a simulated browser have the same syntax. This allows a test team to define their own balance between scripting and script generatin. I really like WET and looking over its code has strongly influenced the direction that i want to take Watir in. 1.0.0 release came after a good delay of delay. The main reason for the delay is that WET has undergone a major revamp in terms of its implementation. The core functionality of WET itself has not changed though. The two major changes in WET are a) The WET UI has been disintegrated and made into separate components and b) dependancy on the RPC server to identify objects has been removed.